The human head louse (‘pediculus humanus capitis’) affects around 20 million people worldwide each year. A head louse infestation (‘pediculosis’) is not a sign of bad hygiene or poor parenting. It just means your child has had head-to-head contact with someone with head lice. A head louse infestation is sometimes referred to as ‘pediculosis’. 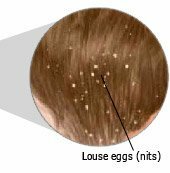 Head lice are tiny (2-4mm long) wingless brown hair parasites that live in the hair and on the head of humans. Head lice are highly contagious and are easily spread through head-to-head contact. Head lice cannot survive for long away from a host as they need regular meals. then after shedding their skin (moulting) three times, head lice nymphs become mature adults; this normally takes 10 to 14 days. Within a day of becoming adult hair lice, male and female lice will start to reproduce. The key to treating a lice infestation – and preventing re-infestation – is to break the lifecycle with a product that removes the eggs before they can hatch. Head Lice - the common sense approach - everything you need to know about head lice. Many people have suffered with this problem and we have many pages featuring personal experiences, home remedies, product reviews etc.